So! 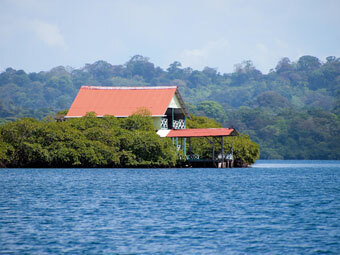 You have found the perfect waterfront site on a river or perhaps on an island. You have determined what your building project will look like and now you have to consider what to do about the landscaping. There is a lot to be considered on this subject but in actuality, the reality is that there is a limit on options available when living among the mangroves. This does not mean you are doomed to have no view to the water, live entirely indoors or get used to drenching yourself in insect repellant for the rest of your days. I'll cover some solutions as we go along, but for now, lets consider the mangroves themselves. Mangroves are found in most tropical and subtropical tidal areas. This includes estuaries and marine shorelines. Not too long ago they were considered a natural nuisance in the United States and other areas of the world and were nearly wiped out in many locales. 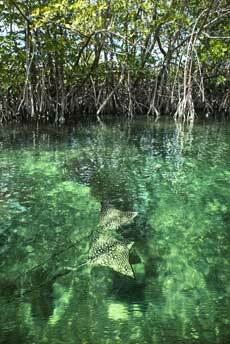 We now know that mangrove forests are of extreme importance to the natural balance of the marine environment and to the creatures that live within then. Because of that we should all feel the need to co-exist and live with and within these mangrove habitats. In most cases, this requirement to co-exist has been decided for us by various federal, state and local authorities. You will need to know all of the rules of working and altering these mangrove systems, and it may be sensible to consult an expert in this subject. But for the most part and in most cases you will be told that you cannot remove the mangroves, but that you may be able to trim them to a lower height, thin the canopies out or even some combination of the two remedies in order to acquire a view of the open water. At first this will upset you but eventually you will come to appreciate the mangroves existence over time when you understand their function and see just how many benefits you will receive by having them as a part of your overall landscape environment. 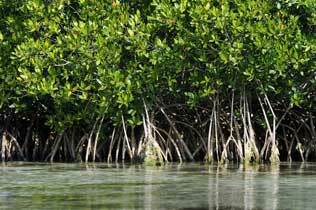 Mangroves protect coastal areas from erosion and storm surges especially during hurricane and tsunami events. The mangroves' massive root systems are efficient at dissipating wave energy. Likewise, they slow down tidal water enough that its sediment is deposited as the tide comes in, leaving all except fine particles when the tide ebbs. In this way, mangroves build their own environments. In areas where roots are permanently submerged, the organisms they host include algae, barnacles and oysters which all require a hard surface for anchoring while they filter feed. Shrimp and crawfish use the muddy bottoms as their nursery and home. Mangrove crabs munch and mulch the mangrove leaves, adding nutrients to the mud for other bottom feeders. Even the leaf litter from the mangrove plants themselves serve to appropriately enrich the mangrove fringe. Another wonderful benefit of living within this natural marine environment is watching the variety of birds using the various trees and shrubs to roost, nest or stalk the waters underneath their favorite limbs to acquire a dinner of fish, crabs or shrimp. 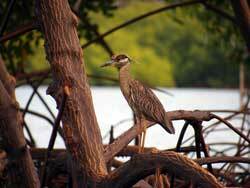 Expect to see herons, egrets, flamingos, water turkey, pelicans, owls and many more depending on your location. There will also be local mammals that investigate the shoreline for snacks. 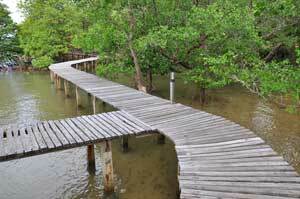 These attractions alone are well worth the tradeoff between having a mangrove fringe or a totally cleared shoreline. Now, concerning your view outwards into the open water. This can be accomplished by raising the finished floor height of your structure as high as practical above the shoreline grade, providing of course that this is a new proposed structure. In many cases where the mangrove can be maintained at a height of six foot above the shoreline grade (at mean sea level +/-), having your finished floor height at 10 feet in height above mean sea level, means you are already 4 feet above the top of the trimmed mangroves at the level of your feet. If you are between 5 and 6 feet tall, your eye level view would be about 9 feet above the trimmed mangrove height which is more than enough for a great view, even if you are sitting down..
Raising your finished floor level takes care of the visual problem, but we also have to be concerned with interaction between the marine environment and the upland portion of the building site. For the most part any land that does not extend waterward of the high water line or does not have wetland vegetation established within it is not a concern of the environmental enforcement agencies. 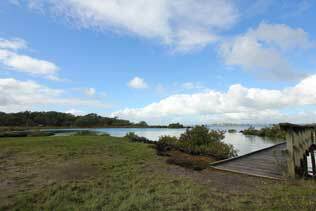 However, there may be jurisdictions where any structures such as retaining walls must be kept a certain distance from the mangroves or other protected wetland vegetation. This requirement needs to be established. Once that is determined it may be desirable to construct retention systems that will protect the upland areas from erosion factors due to storm surges or gradual wave accretion issues. The implementation of retention walls also assists in the creation of retention swales, which will keep storm water runoff from entering directly into the wetlands. Direct water runoff introduces excess fertilizers, pesticides and other undesirable elements to adversely influence the water quality of the wetland areas. Once your garden is out of the wetlands jurisdiction, you are not restricted in the choice of your plantings and garden structures. However, proper design standards urge the owners and designers to be considerate of practical issues and design aesthetics when selecting landscape elements. Garden structures, such as overwater walkways, docks, gazebos, arbors or pavilions look best if they look natural to the environment, particularly if they are adjoining the mangrove fringe. Further distant from the shoreline, it begins to matter less and less. Plant selections should follow the same rules. The closer to the shoreline and mangrove fringe, plantings should look well with the natural vegetation and adapt to the climatic conditions in that environment. As the distance from the mangroves increases, the planting palette can diverge a bit more and other landscape design concepts can be perfectly fine. It is always desirable to select plantings that require little in the way of chemical spraying or excessive fertilization when they are close to the wetland environment. There’s a lot to learn when locating a project in an environmentally sensitive area, such as maintaining an open environment to facilitate airflow throughout the site. In well drained tidal wetlands, salt marsh mosquitoes are principally found behind the mangrove communities in the 'high' marsh, where pools of water in salt marsh areas are left by spring tides or are filled by runoff and rainfall, and are not flushed by the daily tide movement. In tidal wetlands that are not well drained, salt marsh mosquitoes are also able to exploit impounded 'stagnant' pools retained within stands of mangroves and some salt marsh vegetation on the 'low' marsh, caused by siltation or other blockage of the normal tidal channels and not subject to the normal daily flushing. We recommend finding a qualified designer with experience in the mangrove environment to help you with the rules and multitude of choices that might be made for manipulating the landscape inside these wetlands. But the point I am trying to get across here is not to fear locating in or near a mangrove forest or fringe, but plan well and enjoy the exceptional benefits of living this close to one of natures most beautiful and interesting environments.